Mail4Rosey: Mastey are the masters in eco-friendly and healthy hair care and color! Mastey are the masters in eco-friendly and healthy hair care and color! Everyone seems to be turning to more natural products these days, and hair care is no exception. That is why when the Mastey Hair Care product line was introduced to me, I opted all-in to try it. Every product in the line is 100% Vegan, has no Parabens, no Sodium Chloride, no MEA or DEA, no synthetic dyes, no Phthalates, and is Gluten-Free. Even better, the color protecting line is infused with quality ingredients such as Olive Oil, Certified Argan Oil, and anti-oxidant rich Grapeseed Extract. Each product was made to strengthen your hair while still allowing it to maintain moisture. And the scent is really pleasant, mildly smelling to me, like grapes. For the record, I have fine hair. It's not exactly thin, but it's definitely fine, so products that contain oil are better suited usually for my husband and children, all but one of whom were lucky enough not to inherit my texture of hair. In fact, their thick, robust hair holds oil-infused products well and looks shiny, full and very attractive when they pamper themselves with it. The Mastey products did not disappoint, and everyone who has used it thus far, myself included has been pleased with the final results. The shampoo and conditioner are not heavy, or too thick for me, yet they were heavy and thick enough for the rest of the fam., so it's one of those things where everyone in the house had a thumbs up for the final review. I found the Beach Spray to be unique! This gives you a windblown beach look when you spray it in your hair. You can get shampoos, conditioners, oil treatment, therapy spray, etc. from the line. You can also get a Certified Argan Oil and Olive Oil with Grapeseed Extract and Vitamin E leave-in oil treatment, styling gels, etc. One product I found particularly exciting, because it was brand new to me, is the Color Protecting Beach Spray. This is designed to give you a windblown beach look in both texture and volume. products available in the Mastey Line. 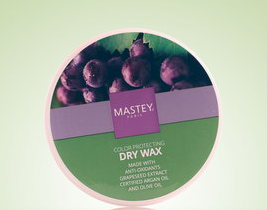 While I was poking around the webiste, I also saw a Mastey Color Protecting Dry Wax with Argan Oil & Olive Oil. It's just one of many innovative products available. 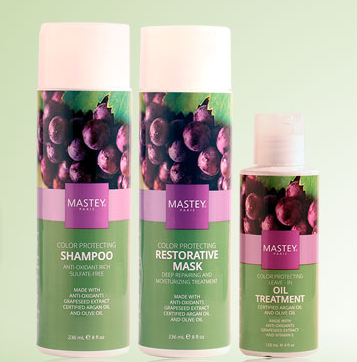 Mastey—the masters in eco-friendly and healthy hair care and color! When it comes to healthy, beautiful hair, Mastey is the clear choice! Without the use of chemicals and additives that can harm your beautiful locks, you get shiny hair color that will last, vibrancy and dimension you will adore, and healthy ingredients your hair will love. When choosing hair care products, there is more on the line than just the color. With Shampoo and Conditioning Sulfate-free since 1978, hair stays protected. How do the products you choose make an impact on the environment? Mastey products are eco-friendly, green focused, and good for your hair, so you get the gorgeous natural hair color you desire and the peace of mind knowing your hair care products are environmentally friendly! 100% Vegan- With natural ingredients comes natural beauty that is good for your hair! Using plant-based moisturizers means you will have softer and more natural feeling hair, with absolutely no animal based products! Rich in Antioxidants- Not only do we leave out the bad ingredients, but we add good for you grape seed extract to our line of hair color and products! This means longer lasting color and luscious, touchable locks that you will love! Formulated with Argan Oil & Olive Oil to protect your hair from styling heat and the environment -- let's your hair be soft and shiny without any greasy feeling. When it comes to hair care, Mastey is a natural and safe choice for healthier hair products. Developing quality products with integrity, and a commitment to the environment, your hair is in good hands with Mastey. Mastey is a family owned business that has been creating healthy and beautiful hair for over 40 years. Henri Mastey began his career as a stylist in Paris in the 1950's. Having a passion for chemistry as well as beauty, Mr. Mastey was able to combine his love of chemistry with hair care through his line of hair color and hair care products! Growing from a small business, Mastey products are now sold internationally and Mastey is considered a pioneer in the beauty industry. With their green focused products, Mastey is pioneering the industry of hair care towards products that create gorgeous, long lasting color, and thoughtful use of components that are eco-friendly, making their eco-footprint light, but their footprint on the industry radiant! It sounds like an awesome hair care line. My sister in law is a vegan, so she will appreciate this, too. Thanks for the recommendation; I love discovering great new beauty products! More healthy and environmentally friendly is a good thing. Definitely sounds like I should try this line. I also have fine hair and I'm glad to know it works on that as well. Great review. I love new products, they are addicting. I definitely have thick hair, so it may work well for me. Mine gets so parched from being colored every few weeks. I really need to try the shampoo!! Sounds great. My hair isn't a fan of oil based products but they work on my daughters hair. Its so interesting how different our hair is from one another. I would love to try the shampoo & conditioner of this line. I'm always looking for quality products for my hair. I love good natural hair care products! And my wavy/curly hair loves some extra oil, too. These look like amazing products! I will have to give them a try! Sounds like a great product line. There are so many toxic chemicals hidden in everyday products- it's scary. Oh I really want to try this out on my hair! It is pretty thick and I could use some help. Thanks so much for sharing these awesome sounding products. I've love to try anything that would give me a windblown beach look. I hardly ever color my hair because of how hard it can be on hair. I want to try this product and see how it works in my hair! Thanks for sharing! I have thick hair which has thinned. I love finding products that help me have great looking hair and are more 'green'. These products look amazing. I need to color my hair. I feel like it needs a little updating. Interesting. I don't think we have them here - but they sound good. Are they cruelty free (not tested on animals) as well do you know? And what advantage does the gluten free aspect bring? Can coeliacs absorb gluten through their skin? Thank you. I should have just googling myself. Somedays I am lazier than I like - or should be. I think I'd love these products. I'm not too much into all-natural, but it is an advantage to me. I am glad you liked the beech spray in particular. It's the first time I heard about these products. They sound like great products. I'll go look for them here. This is a pretty interesting product. We can use more eco friendly items here on Earth for sure. Will look into it more. Like you, I have fine hair and have to also becareful of using heavy oils. I do love Argan Oil though and this line of products sound like they are worth checking out! Sounds like a healthy beauty products to try. I like all the ingredients. I will check this out. Sounds like a great product. Also, very healthy! These sound like great products. I'm a big fan of using eco friendly products whenever possible, so I can't wait to give these a try. that sounds great for summer. my hair gets so dry. This is a new product line for me, but I'd love to try it. So much gets absorbed into our bodies through our skin (scalp included), so I try to use eco-friendly products. I do like that is eco friendly and paraben free. I'll have to pick some up and give it a try. I like the idea of using products that are all natural and earth friendly. I think it is best to try to get as close to nature as possible when you are ingesting and putting things on your body. I am not sure how good the oil is in these cleaning products ( haven't done any research ) but I tell you... I LOVE THE WAY CLEANING PRODUCTS FOR MY HAIR MAKES MELT HAIR FEEL AND LOL OF IT HAS OIL SUCH AS OLIVE AND ARGAN IN IT!!!!! These sound like great products! I have a pretty sensitive scalp, so I am always looking for something that isn't make with harsh chemicals and that doesn't have a lot of fillers/fragrance in the ingredients. Oh wow – the packaging on this product line looks good enough to eat. It took a while, but I've been appreciating skin and hair care made with healthier ingredients. That looks awesome!! I'd love to try it! This is a great hair care. It makes you look good and feel good! Very healthy. This is my first time ever hearing of Mastey. 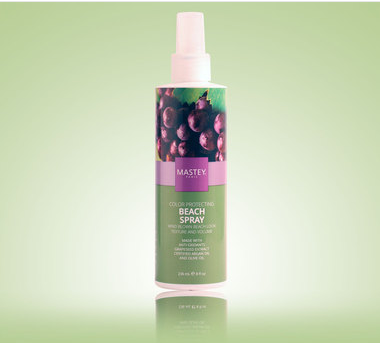 I would love to try out the beach spray! I would love to try this product and see how it works on my hair. Thanks for sharing, sounds like a great product.